The Amon Carter Museum Collection. Text by Martha A. Sandweiss. Oxmoor House, Birmingham, AL, 1982. 155 pp., 12x11¼". 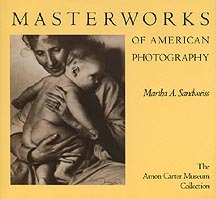 155 masterworks of 80 American photographers from the Amon Carter Museum collection, separated into sections on the photographer as historian, early photography in America, nineteenth century landscape and portraits, pictorialism, straight and documentary photography, and twentieth century landscapes.